Dr. Shenot is a consultant at the RSCICDV, treating patients with spinal cord injury. He is an Associate Professor of Urology at Thomas Jefferson University. 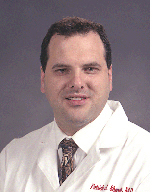 He received his medical degree from SUNY at Stony Brook School of Medicine in 1991 and is board certified in Urology. In 1997, Dr. Shenot completed his residency at Thomas Jefferson University, in addition to, completing a fellowship in Neurourology in 1999. He is principal investigator in several clinical trials involving genitourinary disorders. His research focuses on the treatment of incontinence and lower urinary tract dysfunction including sacral neuromodulation, biologic neuromodulation and tissue engineered bladder augmentation. Dr. Shenot is a member of the American Urological Association, American College of Surgeons and the Mid-Atlantic Section of the American Urological Association. He has made over 50 presentations at national conferences and has been the recipient of awards for excellence in research from the Philadelphia Urologic Society and the American Spinal Injury Association.